…and the whole world opens up to her. Hi! 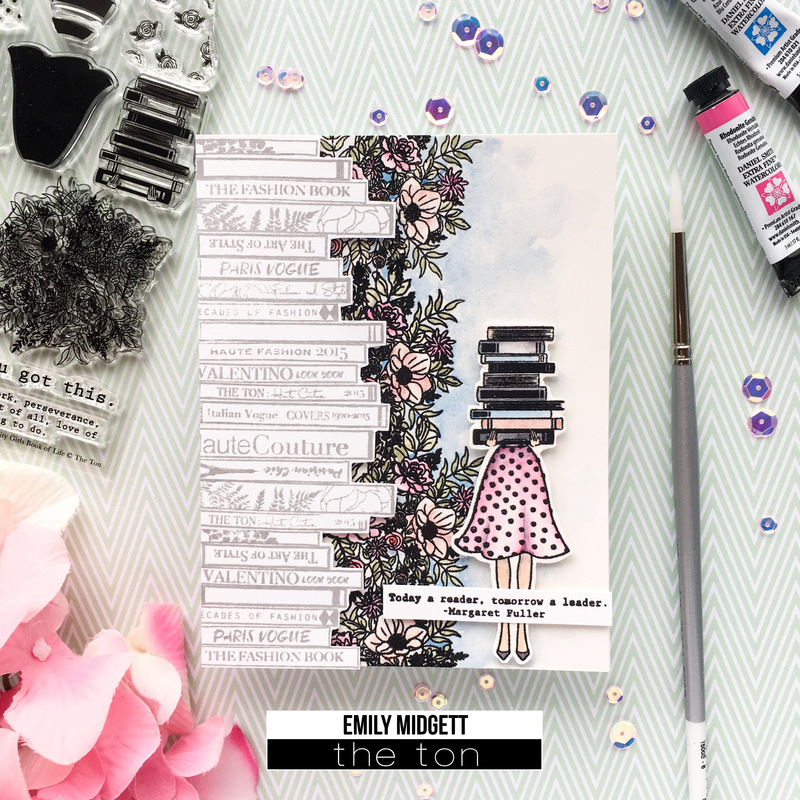 Emily here with you today with a pair of projects that feature a few of my favorite things: books, flowers, and watercoloring. 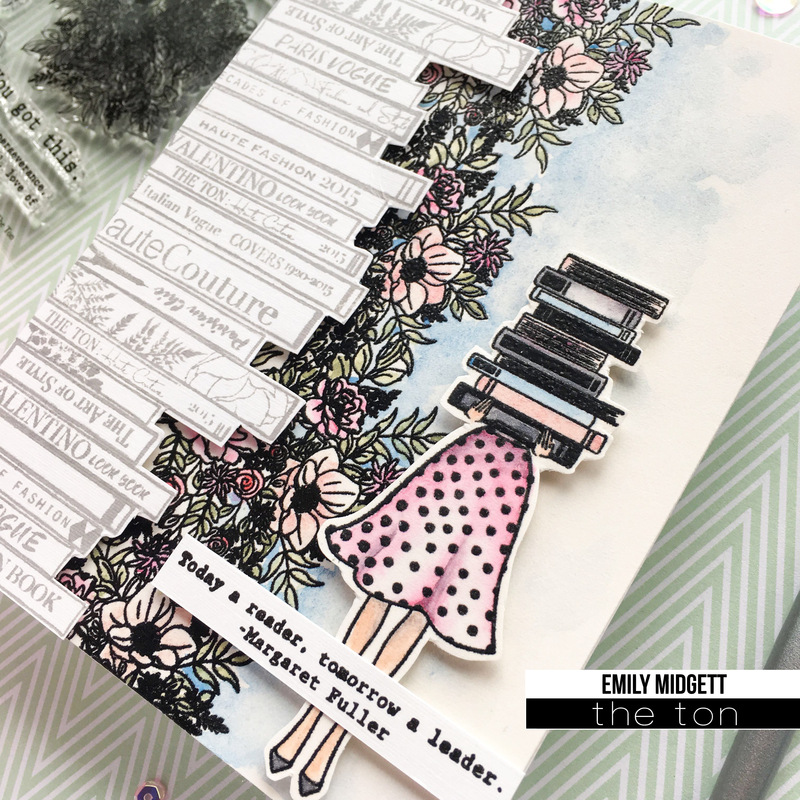 For my first project, I decided to use the fabulous new City Girls: Book Life with the Haute Books stamp set. I stamped the books along the edge of a piece of linen card stock using Crystal Pewter ink, then fussy cut them out. I used that as a guide for the placement of the flower bouquet from the Book Life set to create a cascade of flowers down the front of the card base. I stamped that with Versafine, then clear heat embossed it. I watercolored the flowers and the background with my Daniel Smith watercolors. I stamped the stylish reader using Versafine as well, and again watercolored her with my Daniel Smith watercolors. I fussy cut her out, then popped both her and the books up on the card front with dimensional adhesive. The last step was to add a sentiment strip over the top of her legs. I love the sentiment, too; “Today a reader, tomorrow a leader.” SO true. Next, I die cut the beautifully scripty hugs word die and covered it with Versamark, dipped it in the Rose Gold Embossing Powder, and heated it, then repeated the process to have a custom Rose Gold die cut. I also heat embossed the sentiment from Chandelier using the Rose Gold Embossing Powder onto a strip of vellum. 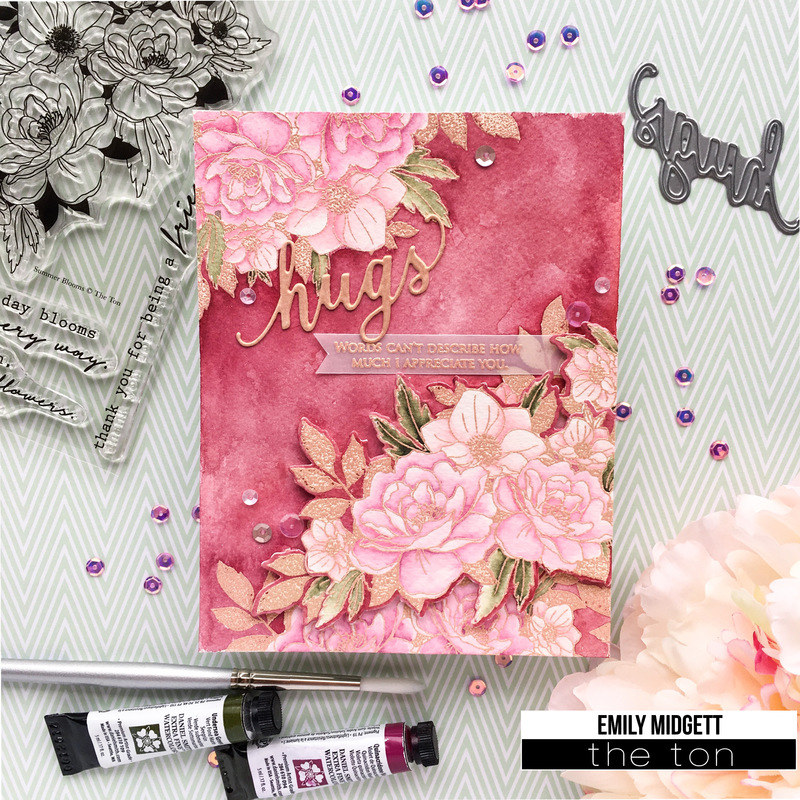 I trimmed some of the flowers off of the edge of the Summer Blooms die cut, popped it up with dimensional adhesive, and adhered my greeting down. A smattering of sequins finished it off. Well, that’s all for me today! I hope you enjoyed these cards! Have a fabulous weekend, friends! Wow, What Amazingly Beautiful cards!! !